The blog below was written in 2013. Even five years later, there is much to be thankful for. Although this Thanksgiving is a somber one for me personally, and for our state due to the immeasurable trauma from the fires, there is some room for thanksgiving. I’ve strove to be grateful and appreciate all that has come my way. I know I take much for granted, but there is much for which I am deeply and truly grateful. Here are a few things. Over five years ago, I had to go on assistance. This was a hard decision to make and I had to swallow a lot of pride, but it was necessary for me and my family. Actually, I should have done it much sooner. I want to say thank you to the taxpayers who support this government that provides this service to those who are in need. I am slowly weaning myself off assistance and am glad to be working and paying taxes to replenish at least a fraction of what I used. Nonetheless, I am thankful to have had this resource available, and I thank the community for supporting this program. I am thankful for the many friends I have in my life. To those who have given me emotional and prayer support as I raise these kids on my own, I thank you. My Facebook friends have encouraged me in my writing. Thank you. I am thankful to my family and all the help they have given me. And, of course, my ten children and one son-in-law. In countless ways, great and small, they bless me, they love me, they honor me and they are my greatest gifts. Even in my trials and afflictions, I can be thankful, I stumbled on this verse from Psalm 119 during a dark time of my life: “It is good for me that I was afflicted, that I may learn your statutes.” (v. 71) As difficult as it was to be thankful for the trials in my life, I have learned that those times have yielded the precious fruit of patience, trust and an increased faith. I hope my children learn to be grateful and be thankful for all the benefits, as well as the difficulties, that come their way each day. Rarely does Mark get a commission to do a landscape from a photograph, but my old friend Donna had taken a photo that had a profound meaning to her, and she wanted Mark to paint it. When she explained the story behind it, I understood why. On Feb 19th of this year, Donna’s daughter found out that David, the young man she was seeing, had OD’ed. They were all devastated. A few days later, on Feb 21, Donna went to work early and decided to take a route she rarely takes. 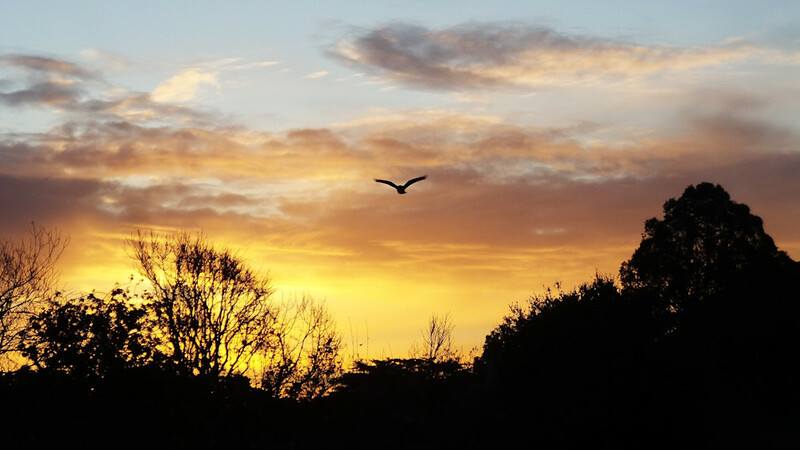 The sunrise was brilliant, so she pulled over on a residential street in South San Francisco, to take this picture. Later, when her photo was posted on the Everything South City site, someone commented on it, saying that it was very meaningful to her. Not the bird flying above, but where it was taken. It was David’s mother who told her that the photo was the exact location where David had died. Donna had no idea where David had died when she was inspired to take that sunrise shot, but now this image has become more of a significant landmark to everyone involved. And for you, the reader, this image becomes one more example of how art can imitate life, and how an unseen God can intervene in the world, making Himself known through an art form, captured at an intersection of time and space, inserting His presence where He is needed most, to help in the process of grief, honoring a young man taken too soon. Because of Donna’s keen eye for finding beauty in her surroundings, stopping from her everyday routine to appreciate it, she now can bless David’s mom with the gift of this painting. Life is a great sunrise. I do not see why death should not be an even greater one. Mark also gets to be a part of this story. 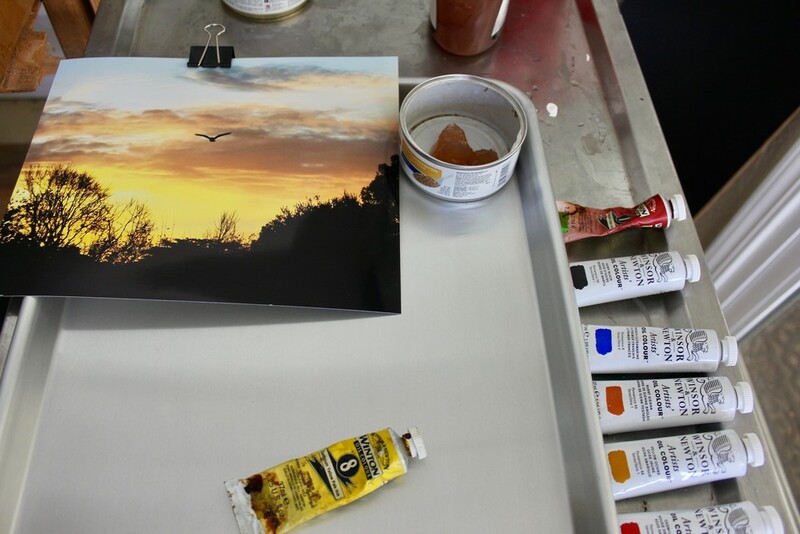 By Donna commissioning him to paint this photo, Mark can now extend his brush to communicate more of God’s beauty and love, to give a little more comfort to a family still hurting from this loss. What a privilege. 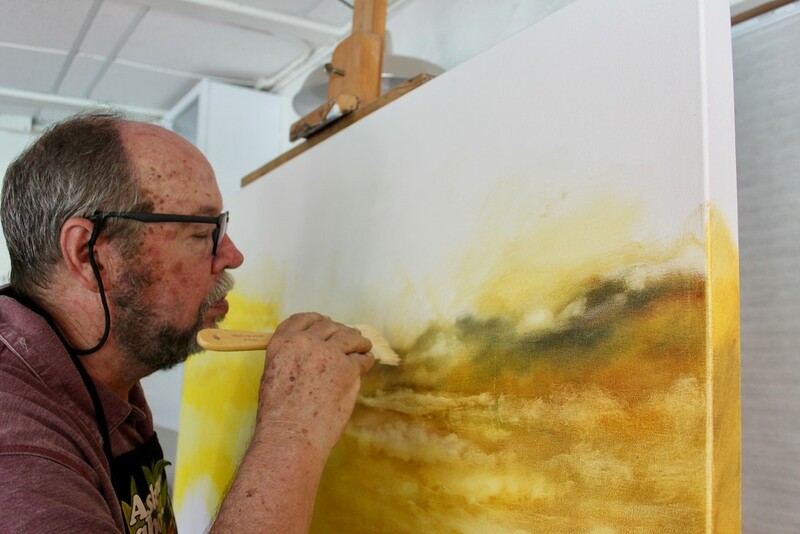 Mark working on, “David’s Sunrise,” in his Fresno studio. P.S. from the Shoelady: David’s mom, Karin Cunningham, was featured on San Francisco’s KRON Channel 4 sharing her story of loss and her determination to warn kids and their parents about this epidemic and to eradicate this danger from her community. Fentanyl laced drug overdoses have increased hundreds fold. Below is the link to her story on Channel 4. See her interview below.